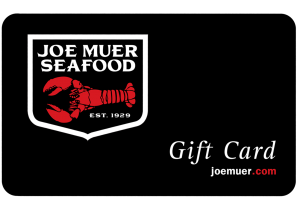 Give your friends, relative or colleagues the wonderful taste of Joe Muer Seafood with a Gift Card. Please call us at 313-567-6837 for more information and to check your balance. For online orders please see options below. All orders placed by 4:00pm will be processed the next business day following receipt of orders. Please allow up to 3 to 5 business days for USPS delivery.